I was never crazy about Indian food, that was, until I ate at Raj's. The food is the best aspect of the Raj's experience. I have ventured deeply into the menu and I have never been disappointed when it comes to flavour. Raj's achieves the perfect level of spice and heat. Plus, with a hint of Singaporean, Raj's shakes up the classic dishes— the mango chicken is so much more than a dish to fall back on. Portions and cost are another positive aspect of Raj's food, both generous in light of the excellent food quality. Closely following the food, the service and location compliment the Raj's dining experience. The staff, always friendly and accommodating, give Raj's its' family feel. Deliveries are always early or on the dot, and I have never had issues with my orders. And, what's more, this restaurant's central Brisbane location makes it a hot spot for a quick Friday night dinner. The only offputting element of eating in at Raj's is the restaurant's aesthetic. Instead of place mats, I found myself eating off a great sheet of construction paper, and, when gazing out the window, my eye could only rest on the car park. A charming little restaurant and my partner's favourite for sushi, the Dami experience is that of stylish Japanese aesthetic and innovative (but not costly) sushi. Dami, with its modern Japanese decor and intimate lighting, is a great choice for date night. The sushi is so fresh, delightfully presented, and delicious that my partner and I always linger on the Fushion Roll menu. 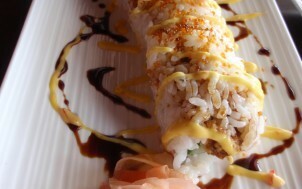 From the Atlantic Salmon to the Lion King to the Crunchy Roll, any option is sure to please. Plus, to meet the Dami staff is also a positive experience as they are consistently friendly, hospitable, and efficient. The only negative aspect of Dami is the location and limited capacity. Dami is a fair way out of the city, so it's not a restaurant one can necessarily stop into before a night out. Plus, the size means that it is often booked out on busier nights, so I would recommend making an early reservation in order to assure a table. Seated in the modern and busy precinct of South Bank, Bamboo Basket is a cosmopolitan, but economic, option for dining out with friends. Authentic and quality Chinese food can be difficult to find, but with innovative dishes such as strawberry pork and a scrumptious selection of dumplings, Bamboo Basket will reignite your passion for Chinese (and fill you thoroughly with their very generous portions)! With its' spacious venue and a rising popularity, Bamboo Basket also provides that hustling, bustling inner-city ambiance which accompanies authentic Chinese so well. And, being located on Grey Street, there is much to do afterwards to work off that full stomach: catch a film at the cinema up the street, take a walk along the promenade, or simply enjoy a little window shopping.